Dr. Gerlach and Lux stopped by Pure Plates in Kirkwood for a FB Live this week to answer some questions about how to eat healthy. Vitamin D: Why is it so Important for Your Health? 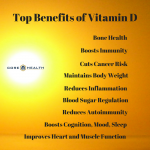 The sunshine vitamin, vitamin D, is important beyond belief for optimal health. Emerging science shows that vitamin D may have a bigger impact on our health than previously thought; influencing everything from overall health to autoimmune conditions. After all, vitamin D helps control over 1,000 genes in our body!